1. 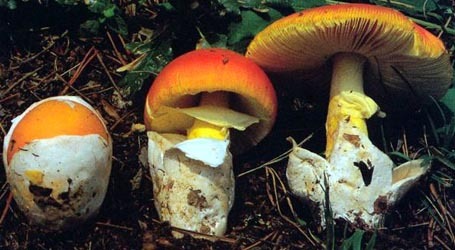 Amanita pakistanica, NW Frontier Province, Pakistan. 2. Amanita pakistanica, NW Frontier Province, Pakistan. intro The following is based on the original description of Amanita pakistanica. cap The cap of A. pakistanica is up to 80 mm wide, campanulate to convex when young, plane then convex at maturity, umbonate, nonappendiculate, with a striate margin taking up 15 - 20% of the radius. The cap is white to cream colored to pale tan away from the center and orange-tan to light brown to brown in the center. The flesh is white. The volva is absent or present as patches or small flakes; it is membranous to submembranous and detersile. gills The gills are free, crowded, and white to pale pinkish. The short gills are truncate, of diverse lengths, plentiful, and unevenly distributed. stem The stem is up to 150 × 10 mm, white, narrowing upward, with pallid ridges encircling or partially encircling the stem. The flesh is white. The white bulb at the stipe base is proportionately rather small (up to 30 mm wide), subovoid, and difficult to discern in dried material. The somewhat weakly structure and flap-like volva is up to 32 mm high, membranous to submembranous, white to off-white, and attached in part to the upper part of the bulb. odor/taste The odor and taste were not recorded. spores The spores measure (10.0-) 10.1 - 12.2 (-12.8) × (6.5-) 7.0 - 8.8 (-9.2) µm and are broadly ellipsoid to ellipsoid (infrequently elongate) and inamyloid. Clamps are common at bases of basidia. discussion The species is associated with Fir. This species is known from the Northwest Frontier Province of Pakistan. author Tulloss, S. H. Iqbal & A. N. Khalid. 2001. Mycotaxon 77: 458, figs. 1-4.
etymology "Pakistani" or "having to do with Pakistan"
The following material is based on the protolog of the present taxon and on genetic sequence data supplied to RET as part of a joint project with Drs. Santiago Sanchez-Ramírez and Jean-Marc Moncalvo and a joint project with Dr. József Geml. pileus protolog: up to 80 mm wide, white to cream-colored to pale tan with orange-tan to light brown to brown disc, campanulate to convex when young, plane then concave at maturity, umbonate; context white, rather fleshy; margin striate (0.15R - 0.2R), nonappendiculate; universal veil absent or as patches or small flakes, white, membranous to submembranous, detersile. lamellae protolog: free, crowded, white to pale pinkish; lamellulae truncate, of diverse lengths, plentiful, unevenly distributed. stipe protolog: up to 150 × 10 mm, white, narrowing upward, with pallid ridges encircling or partially encircling the stipe at various angles in lower half; context white; partial veil superior to supramedian, white, membranous, pendent, thin and rather easily torn, with edge slightly thickened; universal veil as saccate volva, up to 32 × 30 µm, subovoid, membranous to submembranous, white to off-white, sheathing, attached in part to sides of stipe base, with limbus internus small and placed at point of attachment to stipe. 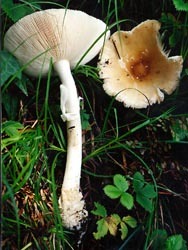 [Note: The above must be modified as follows: bulb present at stipe base, proportionately small (not detected in exsiccata), white; universal veil limbate. pileipellis protolog: 60 - 75 µm thick, orange-yellow to yellow-orange to orange-brown, with very limited partial gelatinization and decoloration present only at surface (one or two hyphal layers), not distinctly divided into sub- and suprapellis; filamentous, undifferentiated hyphae 2.6 - 8.3 µm wide, branching, subradially arranged, closely packed horizontally and vertically; vascular hyphae 3.2 - 14.1 µm wide, infrequently branching, common, sinuous; clamps rather common. pileus context protolog: filamentous, undifferentiated hyphae 2..6 - 11.5 µm wide, branching, plentiful, singly and in fascicles interwoven in open lattice structure; acrophysalides plentiful, thin-walled, clavate to broadly clavate to subpyriform, e.g., 104 × 52 µm; vascular hyphae 4.5 - 23 µm wide, infrequently branching, scattered; clamps present, frequency unknown due to condition of available material. lamella trama protolog: based on material preserved in FAA; bilateral; wcs = 40 - 55 µm (good rehydration); central stratum comprising filamentous, undifferentiated hyphae with partially inflated intercalary cells (ellipsoid to elongate to clavate to narrowly clavate) up to 22 µm wide; divergent, inflated cells predominantly (if not all) intercalary, subclavate, up to 20 μm wide; filamentous, undifferentiated hyphae 2.0 - 6.0 µm wide, branching; refractive hyphae 1.8 - 2.8 µm wide, sinuous, rare; clamps present. subhymenium protolog: based on material preserved in FAA; wst-near = 50-; wst-far = 70- (good rehydration in both cases, but measured closer to pileus than to middle of lamella);comprising two layers of inflated cells (globose to subglobose to ellipsoid to narrowly ellipsoid, infrequently clavate, up to 22 × 20 µm), cell subtending basidium dominantly having major diameter perpendicular to central stratum, with basidia arising from cells of all shapes. basidia protolog: 36 - 49 × 7.7 - 11.2 µm, 4-, and occasionally 2-sterigmate, with sterigmata up to 5.0 × 2.6 µm; clamps rather common. universal veil protolog: On pileus: similar in overall structure to material on stipe base, compressed vertically, with outer layer sometimes missing, with inflated cells dominating throughout remainder. On stipe base, exterior surface: filamentous, undifferentiated hyphae in fascicles and singly, in moderately open lattice structure, with many hyphae sublongitudinally oriented, gelatinized to partially gelatinized. On stipe base, interior: filamentous, undifferentiated hyphae 2.6 - 12.5 (-22) µm wide, branching, singly and in narrow fascicles, interwoven in open lattice structure, dominating near exterior surface, infrequently with yellowish subrefractive walls; inflated cells terminal singly, common, dominating away from exterior surface (especially near inner surface), sometimes clustered locally, thin-walled, clavate to broadly clavate to ellipsoid to broadly ellipsoid, up to 191 × 90 µm, rather commonly ≥ 100 µm long, smaller and proportionately narrower near exterior surface; vascular hyphae scattered, very infrequent, 10.2 - 22 µm wide, sinuous, occasionally branching; clamps scattered, unevenly distributed. On stipe base, inner surface: as thin fragmented layer; filamentous, undifferentiated hyphae gelatinized to partially gelatinized, fasciculate, frequently with sublongitudinal orientation. stipe context protolog: longitudinally acrophysalidic; filamentous, undifferentiated hyphae 2.5 - 8.8 µm wide, branching, dominating at surface; acrophysalides thin-walled, dominating away from surface, up to 508 × 36 µm, commonly with length ≥ 250 µm; vascular hyphae presence uncertain (if present then rare, weakly pigmented, 9.0± µm wide). partial veil protolog: description based on material preserved in FAA; partially gelatinized in material available; filamentous, undifferentiated hyphae 1.0 - 5.0 µm wide, dominating, with dominant radial orientation, with plentiful branching, often in broad fascicles; inflated cells uncommon, clavate, thin-walled, collapsing, up to 47 × 15± µm, radially oriented; vascular hyphae 3.0 - 6.0 µm wide, sinuous, infrequent. protolog: [80/4/2] (10.0-) 10.1 - 12.2 (-12.8) × (6.5-) 7.0 - 8.8 (-9.2) µm, (L = 10.5 - 11.6 µm; L’ = 11.0 µm; W = 7.8 - 8.1 µm; W’ = 8.0 µm; Q = (1.17-) 1.23 - 1.64 (-1.97); Q = 1.29 - 1.48; Q’ = 1.39), hyaline, colorless, thin-walled, smooth, inamyloid, broadly ellipsoid to ellipsoid, infrequently elongate; apiculus sublateral, cylindric; contents dominantly monoguttulate, occasionally multiguttulate; color in deposit not recorded. composite data from all material revised by RET: [241/12/4] (8.5-) 10.0 - 13.1 (-15.5) × (6.5-) 7.0 - 9.0 (-10.5) µm, (L = 10.8 - 11.8 µm; L’ = 11.4 µm; W = (7.4-) 7.6 - 8.6 µm; W’ = 7.9 µm; Q = (1.16-) 1.25 - 1.69 (-1.97); Q = (1.25-) 1.29 - 1.58; Q’ = 1.46). ecology protolog: Solitary. Pakistan: At 2400± m elev. Associated with Abies pindrow Spach. material examined protolog: PAKISTAN: N.W. FRONTIER PROV.—Hazara Distr. - Nathiagali, 10.vii.1994 A. N. Khalid 1071994 (paratype, LAH; RET 140-3), 24.viii.1999 A. N. Khalid 24899 (holotype, LAH; isotype, NY 00632703, nrITS seq'd.). RET: INDIA: UTTARAKHAND—unkn. loc., 2002 K. C. Semwal & R. P. Bhatt 502 (RET 411-7, nrITS & nrLSU seq'd.). PAKISTAN: AZZAD JAMMU AND KASHMIR PROV.—Unkn. Distr., unkn. loc., 18.ix.2003 Kishwar Sultana Nazir and M. K. Leghari s.n. (RET 569-6). KHYBER PAKTUNKHWA PROV.—Abottabad Distr. - Khanspur, 8.viii.2000 A. N. Khalid 78000 (RET 317-6, nrITS & nrLSU seq'd.). NORTHWEST FRONTIER PROV.—Hazara Distr. - Nathiagali, 10.vii.1994 A. N. Khalid 1071994 (paratype, LAH; RET 140-3), 24.viii.1999 A. N. Khalid 24899 (holotype, LAH; isotype, NY 00632703, nrITS seq'd.). Unkn. Distr. - ca. Gilga, ca. Hunza R., 11.ix.2001 Ray Boehne & local villagers s.n. (RET 352-1, nrITS seq'd.). discussion In the protolog of the present species, the authors incorrectly placed it in sect. Caesareae. A partial nrITS sequence produced as part of a study of sect. Caesareae in the J.-M. Moncalvo laboratory (Royal Ontario Museum, Toronto, Canada) did not support the original placement to section. The sequence was made available to RET as part of a joint project with Santiago Sanchez, Jean-Marc Moncalvo and others. 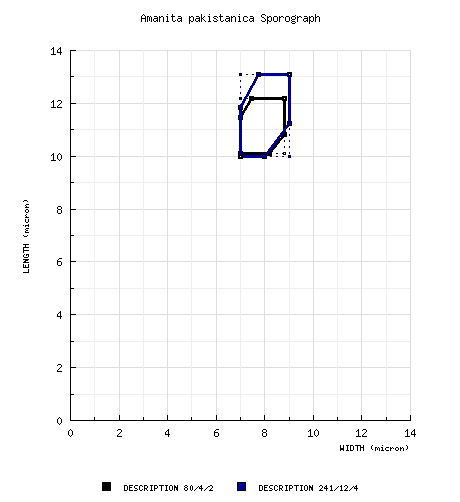 Very clearly a comparison to previously accessioned sequences in GenBank indicate that a placement in sect. Amanita is much more likely. The discussion from the protolog is then no longer relevant. Because of the clamps on the bases of basidia, placement of this species within sect. Amanita would fall with subsect. Amanita in the sense proposed on this site. Further genetic work with Jozsef Geml and Naomi Goldman shows that material identified previously as A. pantherina sensu Abraham and Kachroo should be included in A. pakistanica. The isotype deposited in NY was previously in RET's herbarium with accession number RET 312-1.
protolog: The present species has been called both "Amanita sp. PAK4" and "Amanita sp. PAK5" in correspondence and in keys that have been publicly circulated by Tulloss.